The Niagara Falls PowerHawks completed the regular season with a 4-3 win over the Roc City Royals at the Lakeshore Ice Arena in Rochester Friday evening. 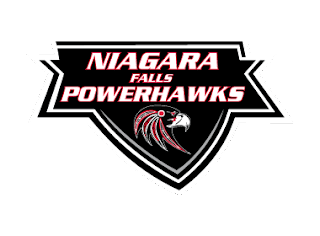 The PowerHawks will be back on home ice at the Hyde Park Ice Pavilion next weekend for the opening game of the playoffs against the Skylands Kings. The exact schedule has not been set yet. Roc City took and early lead with a goal at 6:12 by Spencer Norris. Patrick Nowak and Brandon Corey provided the assists. The Royals upped their lead to 2-0 when Jacob Wood scored at 9:17. Hunter Reid assisted. Niagara Falls got on the board at 11:56 off the stick of Michael Olszewski. The goal was unassisted. Matthew Minichiello tied the game at 4:42 of the third period with the assist coming from his brother, Stephen, on the power play goal. The PowerHawks took their first lead of the evening at 7:22. Gage Mueller was assisted by Kurt Villani and Spencer Hrynczak. Evan Domiano extended the lead for Niagara Falls with a marker at 8:10. Evan Korpolinski and Branden Tripi were credited with the assists. Luke Dobles closed out the scoring for Roc City with their third goal of the evening at 11:20 on the power play. Norris and Corey assisted. Roc City has one game remaining on their schedule for the season. They will be visiting the Southern Tier Xpress Sunday afternoon at 2pm. The Royals did not qualify for the postseason. Skylands still has a pair of games to play before facing off against the PowerHawks next weekend. They will be playing a home and home series against the Long Beach Ice Sharks Saturday evening and Sunday afternoon.